Grand Canyon University is a small for-profit Christian research college. The majority of its students take classes online, and it has been described as "less selective" than other universities. Satisfaction varies wildly, as evidenced from online reviews which range from 3.0 to 4.1 stars. Grand Canyon University is a college located in Phoenix, Arizona. It offers online, evening, and on-campus courses. Degree levels range from undergraduate to doctoral. Read our Grand Canyon University reviews. Grand Canyon University was founded in 1949, and is a regionally accredited, private Christian university, recognized as offering some of the best online education programs in the nation by noteworthy sources including Fortune Small Business, Technology & Learning Magazine, Fox.com, Online Education Database (OEDb) and more. Located in Phoenix, Arizona, GCU offers a variety of nursing and health care programs, including undergraduate, graduate and bridge programs. Students can elect to take courses online or through our evening classes, which meet just once a week at the Phoenix campus and other satellite locations throughout Arizona. There are over 100 majors available in a wide variety of fields, from business to nursing. Tuition for the 2014-2015 year was about $17,050, according to U.S. News. As of this writing there are about 14,500 on-campus students and 60,700 online students. Campus extensions can be found throughout Phoenix, Tucson, and Albuquerque. GCU has a robust athletics program, and has participated in NCAA Division I sports. A number of notable athletes have attended the university. The university has attempted to convert to non-profit status, but as recently as 2016 was rejected by the region’s accreditation body, The Higher Learning Commission. It has been suggested by some alumni and other critics that GCU accepts a larger number of applicants than other universities, in part to pay for its huge advertising budget. 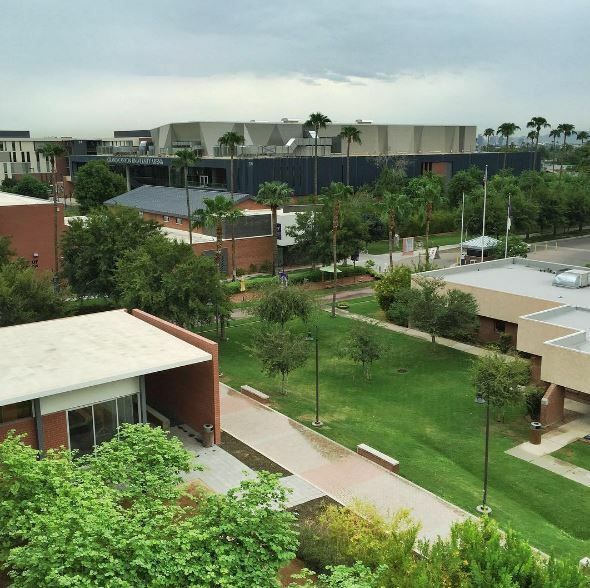 According to U.S. News, GCU is “less selective,” admitting about 55% of applicants. It was ranked as a Tier 2 institution, falling in the bottom 25% in its category. Grand Canyon University is a small for-profit Christian research college. The majority of its students take classes online, and it has been described as “less selective” than other universities. Satisfaction varies wildly, as evidenced from online reviews which range from 3.0 to 4.1 stars. Let your voice be heard! Give GCU your rating below.